The principle of least action states that God always chooses the most minimal means by which to produce the world. For example, if God had the choice to intervene in the world three times or five times but he would still receive identical glory for either number of interventions then God would always choose the minimal means (three interventions). I believe this principle bears truth, if anything it is quite attractive. Now how does this compare with God’s interventions via miracles? Let’s define a miracle as: A divine intervention into, or an interruption of, the regular course of the world that produces a purposeful but unusual event that would not have occurred otherwise. Miracles are not violations of laws of causality. Are miracles thus dependent on strong actualizations or will weak actualizations be sufficient (God weakly actualizes S iff there is an S* such that God strongly actualizes [direct causation] S* and S* → S, where → is “counterfactual implication” [Let S be a state of affairs])? It seems that strong actualization is the most obvious or most appealing means by which God intervenes (miracles), but perhaps weakly actualized miracles is more in sync with the principle of least action. Perhaps at the initial conditions of the universe God constructed the world in such a way that the miracle would happen naturally given the states of affairs at the time of the miracle (including physical states and counterfactuals of human freedom). This could have been the case that a natural quantum perturbation/anomalous event occurs at the time of the resurrection, thus, it is weakly actualized. (Now this includes all historical/physical events in time preceding the resurrection but this perturbation is not strongly/directly caused. In other words, God does not introduce a new cause into the already existing cause and effect system). It would still be a miracle given the religio-historical context which surround the miracle, which God anticipated. These weakly actualized miracles that occur naturally are not mere natural events given the background information. If weakly actualized miracles are a priori defined out of existence by the definition given, then if weakly actualized miracles are plausible, perhaps we need a new working definition. This begs the question, which, for God, is the least course of action: weakly actualized miracles or strongly actualized miracles? I always enjoy dialogues on origins. Big bang standard model or oscillating? Multiverse or just one? Six thousand years or 13.7 billion years ago? Darwinism or design? One thing I’ve noticed with young earth creationism is that they seem to insert, or interpolate, their own presuppositions into the record of nature. They’re performing their own eisogesis into science. I know that one can never free anything from presuppositions, like the reliability of my senses or that other minds exist other than my own, but I wonder if a creationist could look at the data concerning the record of nature, without using the Bible, and come to the same conclusions. If they do then why are so many cosmologists and biochemists in disagreement with them, is it a conspiracy (not using this as an argument)? Why are the only people who believe the universe was created six thousand years ago are those who have a specific interpretation of the Bible? If they come to a conclusion that the universe is nearly 13.7 billion years old then how does that not falsify their biblical interpretation? On what grounds is one warranted falsification? If the former of the two main questions is true, then what is wrong with academia and scientists, why only the select few? If the latter of the two main questions is true, then it seems like young earth creationism is unfalsifiable. Just some thoughts from this morning. A relatively recent paper was published 23 December 2010, which claims we have good evidence for the existence of the multiverse. The most we could conclude from this data is that we live in Max Tegmark’s level two multiverse. I don’t want overstate the claims the authors make. They suggest that it is evidence in favor of the existence of the “possible multiverse” but it must be corroborated with the upcoming Planck data. You can read their method for how they came to their conclusions but the general key for bubble collision detection was using a specified algorithm for detecting temperature modulations that would occur in such events. New Planck data have released since the publishing of the paper but they have specified that they are waiting on the seven-year survey so we shouldn’t expect anything too soon. 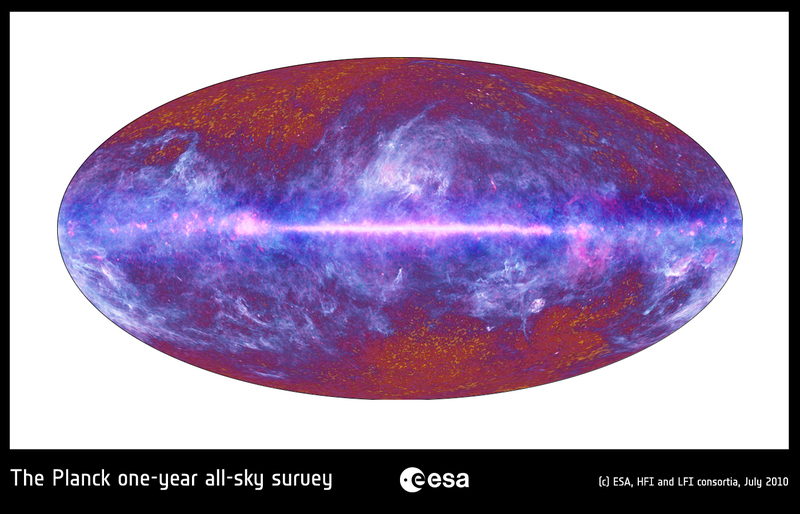 You can view the Planck one-year survey image below (July, 2010). As I’ve said before, I cannot dismiss the multiverse a priori, though I will certainly constrain my position respective to the evidence. The multiverse is not an adequate objection to the argument from fine-tuning nor is it an objection to the kalam cosmological argument (perhaps a later post for an elaboration). I want to encourage everyone to be more open to the multiverse hypothesis because there is more evidence coming in that is supporting it (don’t get me wrong, there is contrary evidence that must be weighed as well). What is beautiful about this whole situation is that cosmologists and theoretical physicists predicted the multiverse from mathematical equations (and no doubt philosophical presuppositions). If the multiverse hypothesis is true it’s a beautiful discovery because we would have gone from pencil and paper with numbers to actually finding what was predicted by those numbers. We do live in an elegant universe [per Brian Greene]. I’m looking forward to what contributions Planck may have in finding more physical evidence of the multiverse. Authored by Stephen M. Feeney, Matthew C. Johnson, Daniel Mortlock, and Hiranya V. Peiris. I attended the Discovery Institute’s Summer Seminar on Intelligent Design (Social Science) in 2010. My thoughts and comments will be general since we were asked not release specifics concerning information being shared (some of it was yet-to-be published and I don’t know if it has been published yet so I’ll remain silent) and I do not want to “out” any other attendees in their academic endeavors. Once you’re labeled as an ID proponent your academic career is potentially slowed down or halted. I’ve already outed myself and I’m pretty vocal about my advocacy of design (I’m a philosopher so it’s not as academically persecuted). I have no negative comments concerning the DI’s seminar. In fact, I have more respect for the institute and fellows. There were two concurrent seminars (natural and social sciences) that interacted with each other on a regular basis and combined on many occasions. I participated in the social science seminar and being philosophy graduate student I’m not as adept in biology, chemistry, and physics as many others are. I certainly received a welcoming abundance of science in presentations, which I thoroughly enjoyed. Some of the lecturers included Stephen Meyer, Michael Behe, William Dembski, Doug Axe, Jay Richards, Jonathan Wells, Richard Sternberg, Ann Gauger, Bruce Gordon, Jonathan Witt, John West, and Casey Luskin. The schedule is demanding since it requires to fit so much material into a time span just over a week-long. You’ll interact with the scholars on a one-on-one basis and even enjoy meals together. They’re not distanced like some professors at the university may be like since there’s only about thirty participants. I still keep in touch with many of the other participants and have made great friendships. What’s beautiful about the seminar is that not everyone believes the same thing. Every participant’s credentials were different ranging from philosophy, theology, law, journalism, biology, medicine, biochemistry, and nuclear physics with only a couple of undergraduates, mostly graduates, and a couple Ph.D.’s. Religious affiliation was irrelevant, views on evolution and origins vary, and friendly/fruitful debate sparked throughout the seminar. The DI accepted participants from around the world: Africa, Norway, Scotland, Wales, California, Texas, and the East Coast. I left Seattle with 59 pages of notes on my computer. I’ve referred to my notes on several occasions and have gained valuable and beneficial knowledge. They provided nearly two-dozen books for me to read in preparation and for studying while there (and of course post-seminar studies). I spent a total of $50 on my ten day endeavor and that was only for a snack in the airport, an over weight suit case, and another snack at a 7-11 down the street from the campus. I highly recommend the seminar to anyone who is friendly and open to the ID hypothesis. I’m doing my graduate research on the multiverse as it pertains to the fine-tuning argument and this seminar has certainly been a valuable asset for me. Thank you Discovery Institute for sharing this knowledge and granting me the opportunity to briefly study under these scholars. What Does it Mean to be an Apologist? The Locus Classicus for apologetics comes from 1 Pt. 3.15. My position is that anyone can be an apologist regardless of what is believed to be true by that person. There may be Christian, Muslim, Atheist, Darwinist, creationist, or agnostic apologists. The subject alone is broad and the predicate does not necessarily entail a religious belief. I’ll refer to our Locus Classicus for our understanding of an apologist/apologetics. πρὸς ἀπολογίαν (pros apologian), “to answer everyone.” This term is used of a formal defense in court against specific charges (cf. Acts 22.1; 25.16; 2 Tim. 4.16). In a more general sense ἀπολογία (apologia) refers to an argument made on one’s own behalf in the face of misunderstanding or criticism (1 Cor. 9.3-15; 2 Cor. 7.11). Perhaps closest in meaning to the present passage in Paul’s use of the term in Phil. 1.7, 16 where he views his own formal “defense” at his impending trial as an occasion for the “defense of the gospel” on a wider front. Here, the language of the courtroom is being applied to informal exchanges that can occur between Christian and non-Christian at any time (ἀεὶ) and varied circumstances. The biblical use of the term is in the context of one defending one’s own personal belief. The legal connotation implies defending certain propositions one holds to be true. So, if I’m a Christian can I be a Muslim apologist? No. I think apologia constrains the use of the word to exclude playing “devil’s advocate.” I can certain argue a Muslim position on something, but merely because I argue for the truth of it in that moment does not make me a Muslim apologist. When we use the term Christian apologist, the subject (apologist) is very broad. When you introduce the predicate (Christian) then it delimits the scope of the subject’s [otherwise] general applicability. A Christian can certainly take on the role of a Muslim apologist in a discussion but taking on a role of X is not being X. In other words, the predicate constrains the subject’s scope as it pertains to reality. Only a Christian can be a Christian apologist and only a Muslim can be a Muslim apologist. To interchange the understanding of the constraining predicate with a pseudo role would an illegitimate understanding. If we were to interchange the scope between the predicate and assume one taking on the role of that predicate would mean that if I propose any proposition that is a shared proposition, with true value, then I will be an apologist respective of any ideology that affirms that proposition. So if I say, “love others as you love yourself” then I would become an apologist for Christianity, Buddhism, and anyone/anything that affirms that proposition. It’s true to say that many propositions are shared amongst ideologies but that’s all I’m arguing for in the first place, all truth is God’s truth and I’m coming at that proposition and placing it in a Christian context. To sum up my position, to be a Christian apologist you must be a Christian. You cannot be a Christian apologist and a Muslim apologist at the same time. This is different from merely arguing for the truth-value of propositions; it constrains this to a personal (respective of one’s self) defense/articulation given the biblical understanding. J. Ramsey Michaels, 1 Peter, WBC (Waco, TX: Word, 1988), 188. A creationist, in the broad sense of the term, is anyone who affirms that God created anything. The most ardent Christian Darwinist is a creationist but the word isn’t regularly used in the broad sense. 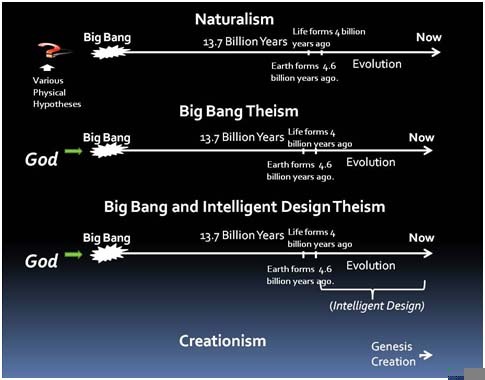 Creationism is popularly referred to as young earth creationism, that is, that the universe is 6-10 thousand years old. I’m an old earth creationist (big bang theism [ID]) in the midst of thousands of young earth creationists. I believe that the big bang (standard model, 13.7 GYA) is the correct model that describes the beginning of the universe. I’m a proponent of intelligent design though I’d consider myself a soft-agnostic with respects to early anthropology. I’m open to common descent but my biggest hurdle to that is the Cambrian explosion. Though I disagree with young earth creationism on many different levels I find it to be a peripheral issue in Christianity. It doesn’t interfere with the existence of God, the gospel, or sanctification in any way. I do get a little frustrated when creationists attempt to make it a gospel issue (though I’ve never met one personally, I’ve read it in the popular creationist literature). The implications in holding to a young earth position are vast and depending on what one’s reasons for holding to it may affect one’s epistemology and modus operandi in science (unwarranted a priori commitments, the Bible isn’t a science book) to name a few. In the end I find it to be an untenable position but most of my friends are creationists and we get along fine, we just simply disagree. I hope that young earth creationists, big bang theists (ID), and theistic evolutionists can function peacefully and not allow this to be as big of a dividing issue as it is today. It’s always fun to see someone’s reaction when they find out I believe the big bang actually happened and that I’m open to the reality of the multiverse. If I’m the leak to the world than so be it, but there’s quite an underground network of big bang theists here at my university, we just learn to keep it hush-hush at certain times (so don’t generalize!). Today Liberty had a convocation speaker who spoke on persevering through those times in life when you experience suffering or unexpected moments that test your faith (what the speaker called “ouch” moments). During the wrap up of his sermon he challenged the student body to persevere through those moments and for whomever will accept the challenge to stand up. The Vines Center was then filled with students everywhere. I was already standing because I was sitting on the concrete steps and I had to stretch my legs in the back but I should have sat back down. That’s a challenge and oath I am uncertain of persevering through. Let me clarify. Perhaps this is unhealthy, but I imagine and play scenarios in my head all the time and I think about death quite often. Just earlier this week I was going through hypothetical situations of losing a loved one. I would ask myself what life would be like if my soon-to-be wife were to die or my father, mother, or any of my brothers. It would be nice and ideal to say that I would freely persevere and understand the joys of the moment and circumstance, but I don’t know how I’ll react. I know this is headline news, but humans are emotional beings and Christians continually disobey God all the time. I resist God’s work in me and I suppress his witness, hence my continual sin. If I were to experience the death of a loved one, the suffering of a loved one, my suffering of cancer or disease, I don’t know if I’ll be joyfully content with those circumstances. I could turn against God and become apathetic. I may run to alcohol to drown my emotions or other outlets. I don’t know. My faith is not strong enough to guarantee that I not have a knee-jerk reaction to circumstances. I’m being honest here and I would encourage you to see if you have knee-jerk reactions in your every day living. Do you ever feel like cussing or getting angry in the heat of the moment? Or do you stay content and collected? Alright, now let’s extrapolate this on a larger macro scale. Maybe you’ll see what I’m getting at here. I don’t believe I’ll ever lose my salvation but I am an emotional being. My rebellion and resistance to God are all emotional. This situation and thought experiment has given me a greater appreciation for the need to love God with all my mind. I can resist God and turn from him, but it is only momentarily. I’ve never been able to imagine my emotions overcoming my reason and sound reason will always persevere through emotions [in due time]. The intellectual aspects of my faith will open my heart back up to the Holy Spirit and it will flush out my resistance. My intellect won’t bring me back to God in these times but it’s a catalyst God will use to accomplish his goal of pursuing me every day. So, can I take the challenge of persevering through every moment? I would like to say that I can and will, but I cannot guarantee that. I can try, and with God’s help perhaps I can do that. In the mean time I will need to pray for God to saturate my mind and heart in him so I won’t lose my way back to the faith if it ever does happen. If I’m going to persevere in the faith I’m going to need God’s preservation.